Forget about looking at the meter, taxi fares for travel from Vancouver International Airport (YVR) are about to take a drastic change. Beginning November 6, taxi companies that service YVR will implement a guaranteed set fare zone system for any trips made to the municipalities of Vancouver and Richmond. Taxi travel to any other locations throughout Metro Vancouver, including any trips to the airport, will maintain the existing metered system. Under the new set rate taxi fare zone system, this means any taxi travel from YVR to the downtown Vancouver peninsula will cost a flat rate of $35. 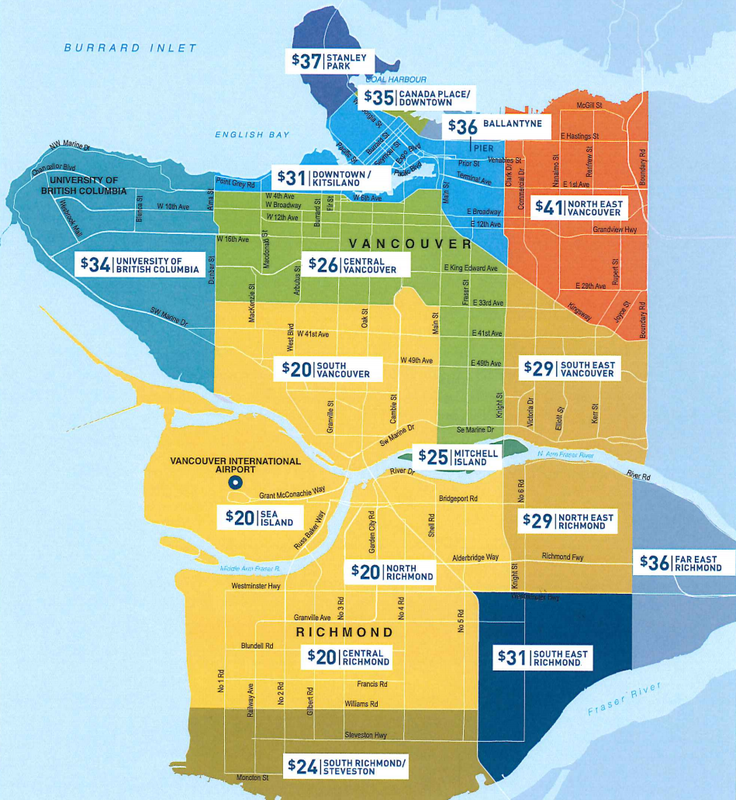 The highest rate is $41 for destinations in North East Vancouver while the lowest rate is $20 for the zones of Sea Island, South Vancouver, North Richmond and Central Richmond. The airport authority says the changes are designed to provide travellers leaving the airport with “guaranteed and reliable” set fares for their taxi trip. It will offer certainty for travellers by letting them know how much their taxi fare will be in advance. “Working closely with the 19 taxi companies who operate at YVR, I am pleased to welcome the new zone fare system for taxi trips leaving the airport,” said Glenn McCoy, Senior Vice President, Finance and Chief Financial Officer, Vancouver Airport Authority in a statement. Similar taxi fare zone systems are also in place at other international airports around the world including New York’s John F. Kennedy International Airport and Toronto’s Pearson International Airport. Alternatively, travellers leaving YVR can also use the more affordable SkyTrain Canada Line. It is only a 25 minute train ride between YVR-Airport Station and downtown Vancouver’s Waterfront Station. However, for intbound travel on the Canada Line from Sea Island, there is a $5.00 YVR surcharge to any concession, adult and senior fare. Travel between YVR-Airport Station and Templeton Station on Sea Island remains free as an airport shuttle. Will the new fare zone system make your taxi ride more expensive? Let us know by commenting below.